Speaking of South Korea, I'll just keep kimchi and Hanbok and everything that I love about it aside, today it's all about RUNNING MAN! Running Man is actually a South Korean variety show which started airing in 2010 and has then skyrocketed to fame among Koreans as well as Hallyu fans. Thanks to many dedicated fans who came up with the subtitles in many different languages, people from all over the world can simply sit at home and enjoy the show. One interesting fact: I have been a K-pop fan since the 2012, but I had never watched a single episode of Running Man till the end of 2013. Whenever I told my friends "I never watch a single episode of Running Man", I would definitely get BOO-ed big time! So last year, having nothing to do at home after my finals, I started watching Running Man. The reason why I wanted to try watching it was because my beloved Yong Hwa 오빠 is like one of Running Man's most frequently appeared guests! So I went onto Google and looked for the episodes that he appeared in. I started with episode 7! And I can assure you that this is my number 1 favourite Running Man episode of all time! Since then, I got hooked, though never got seriously addicted. I love the MCs play, especially the Hide & Seek game! That's my favourite. How much effort did the production crew put into making this show a success! I'm getting blown away now, I should switch back to the main topic. So the other day, right before I came back to Melbourne from Malaysia, the entire Running Man crew actually came to Australia (Brisbane AND MELBOURNE) to film their show! 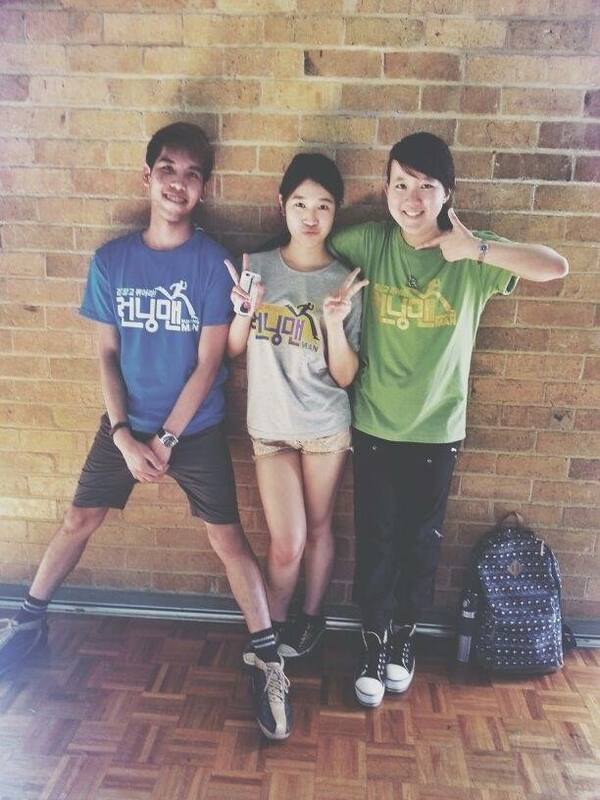 Trust me, nearly all my Melbourne Uni friends went insane, typically those K-Pop fans! I was super jealous when I saw them posting photos on Facebook about seeing the Running Man crew on the streets!!!!! I complained big time at home, in Malaysia about WHY WAS MY AIRTICKET 2 DAYS AFTER THEIR MELBOURNE SHOOTING!!! In order to compensate my major "LOSS"...and my distress dealing with the sad news, I decided to buy myself a Running Man shirt. This is actually my very first time buying something from a Facebook shop. To be honest, I was really worried if it's actually a con job. To my surprise, the owner of Running Man Global Store was super super nice! She told me that (usually) they only accept pre-orders as they don't really have any ready stocks. I told her that I was going to leave for Melbourne in less than a week's time and I really wanted to grab the shirt before leaving. She even went to ask her supplier if there's any ready stock just for my sake!! OMG!! Apart from the casual and comfy style, the quality of the shirt is pretty good too - even its sweat-absorbent level is great! 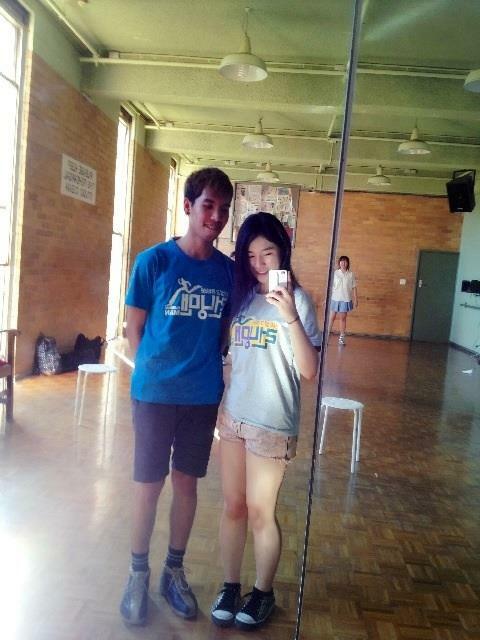 I wore it to dance class actually, so you can just imagine how badly I was sweating >< HAHA! We made a deal to all show up at dance class in our Running Man shirts, and some other people from dance class was like "Why is there Running Man in dance class?!" HAHAHA! 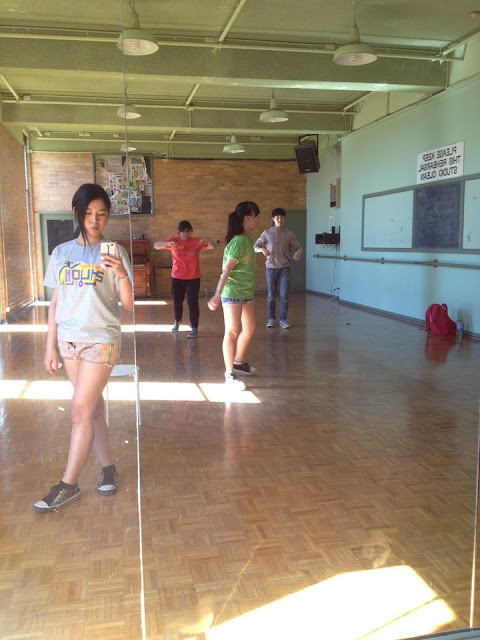 Ignore my weird duck face :p I was too exhausted and hot to pose for a photo properly >< It was a deadly 30 celcius summer day!!! Surprisingly the sizes that I chose for them suit them! PHEWW! 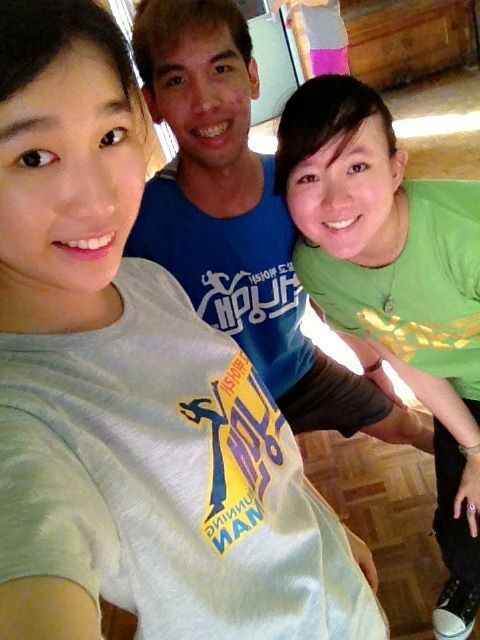 And they like the shirts too ^^ Can't believe I got El's size right! Elissa's isn't a problem for me because the 2 of us are about the same sizes. Due to the fact that I wanted to receive the shirts in such a short notice (and was so demanding WTF), the downside was that I couldn't buy those with my own name tags on! In case you don't know, the reason Running Man Global Store accepts mostly pre-orders is because you get to customize your own name tag, just like how the MCs in Running Man have on their clothes!! Get a whole bunch of friends to buy together then you guys can start your "homemade" Running Man's hide & seek game and start tearing off each other's name tags! HAHA!! Running Man Global Store carries pan-coats and a few other designs of Running Man shirts, head over now and choose your own favourite! I'm so satisfied with my purchase! Being the first Facebook shop that I purchase from, Running Man Global Store really gave me a pleasant experience and I love their service and products! GO TO RUNNING MAN GLOBAL STORE NOW!! ^^ Send them an inbox message if you have any concern, they will get back to you 100%! Anyone here is a fan of Running Man? Mind to share with me which is your favourite episode? Who is your favourite MC & guest(s)? My favourite MC is Yoon Jae Suk because he's really funny! Favourite guest was already mentioned above (scroll back to the top of this post): YONG HWA OPPA! Check Running Man out if you don't know what is that! I can guarantee, they always bring happiness! AHHHHH MORE OOTD PICS!!!! I LOVEEEEEEE!!!!!!! Btw you and El look good together bahahahahaa!